Of late I have been exploring networks of “elite cultural producers,” to borrow a phrase from Pierre Bourdieu—that is, persons responsible for the creative production of literature, art, and similar cultural artifacts. I am increasingly interested in the interactions, exchanges, and processes of these agents because I think there may be new theoretical work to be done in how we (re)describe the role of the perceived author and her/his audience as well as the making of objects we might describe as possessing an element of ‘art.’ This is ground that was tread in some measure by earlier ‘death of the author’ debate(s). However, I would like to foreground a slightly different point of emphasis: how to account for creative license, particularly when “doing” history. Artist creativity or creative license as a category of human activity is something that sociologists, philosophers and those who study aesthetics have rightly folded under the umbrella of culture. Even the most innovative acts of creativity or imagination are tied, in some measure, to certain conventions of the medium in which they are expressed. However, as someone who studies the ancient world, it can be difficult at times to pin down the influences, cross-references, motivations or even technologies of certain artists, writers, and so on. And when scholars attempt to use something like an ancient text as data for asking/answering certain questions about the social practices or networks of the past, it is not always clear how to account for materials that might be a product of creativity or imagination. While I do not wish to overstate the case, in my work on the ancient Mediterranean I often rely on the notion that I can read between the lines of a given text to detect useable information about its writer and the social world in which they live. This is held in tension with the awareness that authors frequently fabricate various facets of their subject matter(s). The difficulty this poses is, if I cannot refute or corroborate certain information elsewhere, I have to question continually the reliability of my source material. This brings to the fore a broader question: in any creative production, how much can one rely on the creator to truthfully communicate anything about “real life”? To get at this question, I have been researching and speaking to (more) contemporary authors and artists about their processes. Increasingly, I find that making concrete claims about reality in literature and art is a pretty slippery business at best. To loosely quote a discussion between a painter and an aspiring writer from the movie Blue is the Warmest Color (2013): artists tend to invent rather than expose. 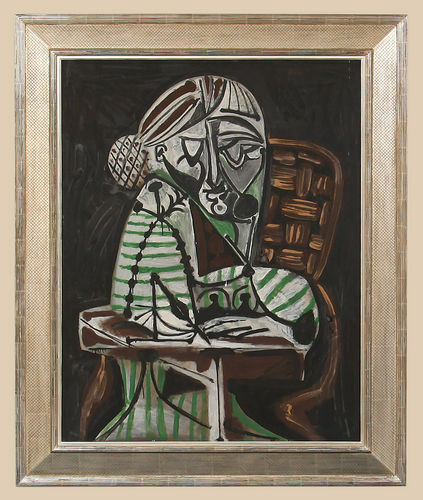 Take a minor example from Pablo Picasso’s paintings of Françoise Gilot. Phyllis Hattis Fine Art via Bloomberg, accessed May 3, 2015. In this painting Gilot is pictured drawing in a style reminiscent of one of Picasso’s influences, El Greco (see El Greco, Portrait of Jorge Manuel Theotokopulus, c. 1600-05, Museo de Bellas Artes, Seville). She is also pictured using an odd, rounded pencil affixed to her desk. Speculating on the deeper significance of this pencil, certain art historians have suggested that it faithfully represents how Gilot worked: she tied her pencils to her desk in order to prevent her children from taking them or knocking them from her hand as they played. If Gilot is to be trusted (elsewhere in the interview, again: “… I never used a pencil like that, so it’s pure imagination”), art historians have missed the mark in reading into this particular feature. Evidently not every element of a creative composition designates meaning beyond the creativity and aesthetic choices of its author. Now, if I knew nothing about Bolina, his life, or his influences, I might understand by virtue of the title of this poem that he is playing with double entendre and that the entire piece is a product of imagination. The use of double entendre in itself would be a literary practice that one could analyze as an element of cultural production and might signal a difference in how to approach analyzing the text. But I can also tell you that, when Bolina reads this poem at various poetry events, his audience, without fail, asks him questions about his daughter and family life. In the interest of full disclosure, Bolina is my fiancé and, to the best of my knowledge, he does not have a daughter or a Midwestern wife. This poem is engaging the language play of John Ashbery and the appeals to intimacy characteristic of Robert Hass. Bolina has imagined these characters and is in conversation with a network of fellow poets. It is this engagement with literary practices that I believe is where we must begin to account for creativity when evaluating artists. To draw an analogy between the approaches to Picasso, Bolina and the ancient world, imagine that I’m reading Bolina’s poem 2,000 years from now in a context in which my material data is extremely limited. Imagine I have no extant evidence of Ashbery and no biography of Bolina at hand. But I’m interested in saying something about rural American life in the early twentieth century. It would be tempting to cite Bolina’s poem. And, interestingly, even if the details he provides are a product of imagination, they are not necessarily an inaccurate description of the period and location I want to describe. But this does not mean I can wholly separate Bolina from his social network of other writers. As a scholar, I can no more assume that Bolina is offering a faithful representation of life than I can assume Gilot sketched with a strange, rounded pencil. Just like the scholars of modern art and culture who have realized that creative acts are expressions of their cultural milieu, scholars of history must remain attentive to the plausible and practical aspects of the creative process. For example, artists and writers tend to communicate and share their materials within fairly established networks. Both in antiquity and modernity, the most immediate and formative social context for the production of any kind of cultural product tended to be circles of like-minded consumers and critics. These circles can be comprised of living contemporaries (e.g., The Algonquin Round Table), past exemplars of the field (in antiquity: Homer, Hesiod or the authors associated with the Second Sophistic), or conversation partners across disciplines. Gilot, speaking of Picasso’s influences, cites his dialogues with poets like Guillaume Apollinaire, competitors (e.g., Georges Braque) or idols long dead (e.g., El Greco). When a poet adapts a line from a fellow poet, or a painter borrows from another painter, it gives us a clue as to the artist’s process, social location, influences and conversation partners—the field of cultural production. This is identifiable data. And perhaps this is as concrete as we can be in our evaluations of artists, writers and texts if we are looking for data on social realities. If we speculate beyond these parameters, we risk “filling in the blanks,” as it were, with anachronisms, assumptions or the accumulated discourses associated with acts of history-making and tradition. And as time stretches between the evaluator and the artifact being evaluated, this risk increases. When it comes to the ancient Mediterranean, these connections and conversations between authors/artists are more difficult to spot for a number of reasons. One, of course, as I’ve mentioned, is a limited and fragmented historical record. The other is the veil that tradition can place over our sources. I have a co-authored piece forthcoming with David Konstan on some of the literary overlaps between the canonical early Christian gospels and other forms of what we term “subversive biography” (*full citation below). It is clear that these gospel authors are aware of a diverse range of biographical types and are in conversation with social peers (i.e. other writers), yet we continue to emphasize in scholarship that they are selecting their materials based on the desires of their fellow Christians. Why extract these writers from their literary networks when we imagine their social worlds? I suggest it is because we are hopeful to learn something about the early Jesus movement and the so-called “early Christian communities” and our desire to find a touchstone to that tradition has influenced how we read these texts. But if we treat the gospel authors as authors with artistic license, we must contend with the possibility that these are writers acting as writers. To my mind, this means that it is possible, even likely, that they simply made most of it (many of the details, moments, histories, and characters) all up. *The forthcoming piece referenced above: David Konstan & Robyn Walsh, “Civic and Subversive Biography in Antiquity,” in K. de Temmerman, ed., Fictional Lives. Ancient Biography and Fictionality. Cambridge University Press, 2015. This entry was posted in NAASR Notes, Religion and Popular Culture, Religion and Society, Religion and Theory, Theory and Method, Uncategorized and tagged Blue is the Warmest Color, David Konstan, El Greco, Fictional Lives. Ancient Biography and Fictionality, Françoise Gilot, Georges Braque, Guillaume Apollinaire, Hesiod, Homer, Jaswinder Bolina, John Ashbery, Pablo Picasso, Phantom Camera, Phyllis Hattis, Pierre Bourdieu, Robert Hass, Robyn Walsh, The Algonquin Round Table, Vogue. Bookmark the permalink.